Right from the start of planning our wedding we knew we wanted to get married in Napa. It has always been a special place for us, from weekend trips to getting engaged at Cade Estate. 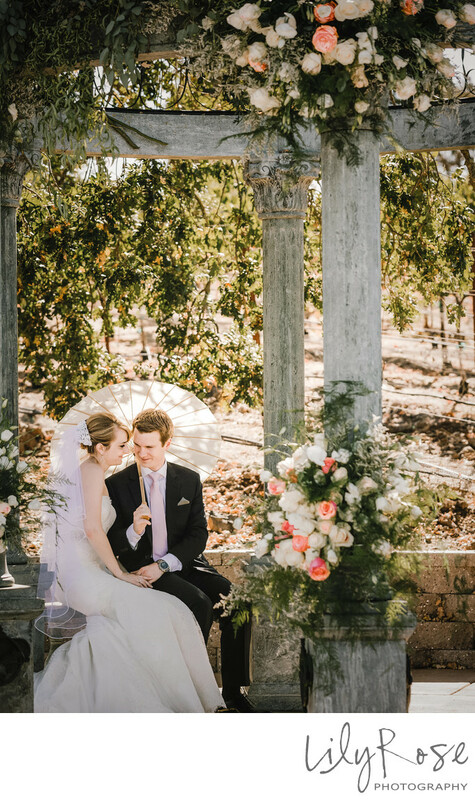 Having our ceremony somewhere with a beautiful outdoor space that showcased the local vineyards was important to us, we wanted the day to have a very romantic feel. We met at a coworkers going away party. On our first date, he picked me up to go dancing in San Francisco and I found an axe in his trunk. Luckily there was no duct tape or rope and I survived our first date. After that it was happily ever after. Our ceremony was one of our major labors of love. My brother was our officiant and he worked side by side with us to create a ceremony that was sentimental and fun. It was amazing to be married by someone who knew both of us well and is an important part of our lives. Another personal touch that was important to me was wearing my mothers veil. A few weeks after getting engaged she pulled her wedding dress and veil out from under the house and I immediately fell in love with her veil. The lace headpiece was so different from what most brides wear today, I picked my dress based on what would go well with her veil. It was so special to wear the same veil she wore 36 years ago when she married my father. Everyone says it, but it is so true...try to cherish every minute, it passes by so quickly.